05:37. Cars stacked up with bikes, riders and a top supporter/chauffeur. It was darned parky. There were clear skies, and an audible alpine-chilled crunch to the air. Pretty pitch. Not even the moon was about. We kicked off the event in good style, with a good ‘n proper, espresso and passed nonchalantly through the starting control desk. We thought we’d be thorough and try and check in twice L! Hmm, well, it was still dark, very early, with approx. 4 hours sleep under the belt and not even the sun was showing signs of a hello yet. Speeding downhill at minus temperatures, the throbbing pain of the blood propelling itself wildly and with force, to unstuck the walls of the blood-starved capillaries in the fingers, was a reminder of what a Victorian winter in the UK could have been like and that yes, long fingered gloves would have been a good idea. The ladies team - Lisa, Wiescia (V) and myself, set off at 6.33 and soon caught the boys up. Rather than wanting to embarrass them with our speed and prowess, after much deliberation, we unanimously decided we’d make the most of the splendid views and glorious food stops. The sun had beautifully risen at 7.15, ahead of us hitting the first ‘strada bianca’ (‘white road’, i.e. off-road trail). By the time we arrived at the second pit stop, the sun came out ‘proper’ and glowed with warmth! A little of the local wine, was tasted to add extra warmth apparently ;¬). The food stops were just amazing. They alone would draw me back next year. The local produce and fayre included the speciality Ribollita soup, grapes, wine, cured meats to die for, sheep's’ cheese, nutella and jams on bread; pannaforte, a sweet delicacy, sort of the Italian equivalent of Kendal mint cake, served by folks in traditional old time attire. Simply wonderful! Lisa sampling the local vino. Well it would be rude not too! Pit stop-warming Ribollita soup was served in great style. The ‘Strada Bianca’– I just loved. If you want to feel like you’re really in the countryside, with no traffic, you have to get yourself across to little ol’ Italy. 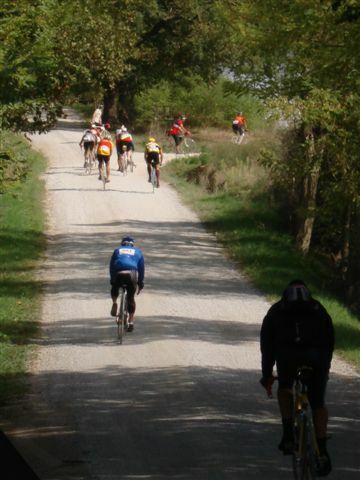 50% of the medium route (120k) was off road. Having a Cyclo cross bike was perfect. There were a good number of hefty inclines and declines. Including what felt like a never-ending, 10k of 4 to 5 blind stepped-staircase style summits at a challenging 15% + (at least) off-road in deep gravel. That brutally sorted out the wheat from the chaff. Yep there were a few … gasp … gents, pushing their bikes uphill! And yep, they were gasping. The start of the 10k of blind stepped-staircase style summits at a challenging 15% + (at least)! Descents were generally reasonable, apart from a few steep’uns with loads of gravel. Great for trying out new techniques!! The event wasn’t timed, so everyone was pretty relaxed, despite the physical challenge. 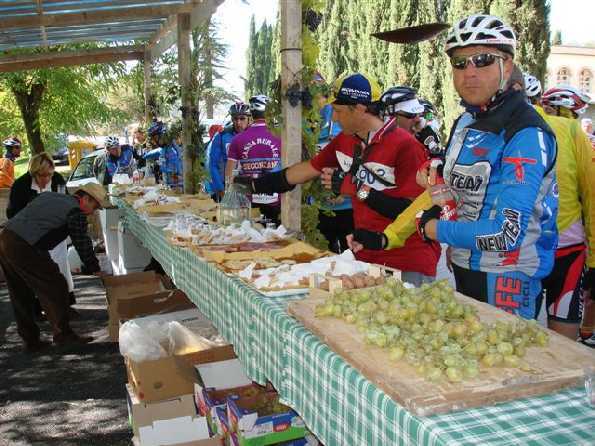 The focus was on cycling and enjoying the scenery, camaraderie and delicious food!! 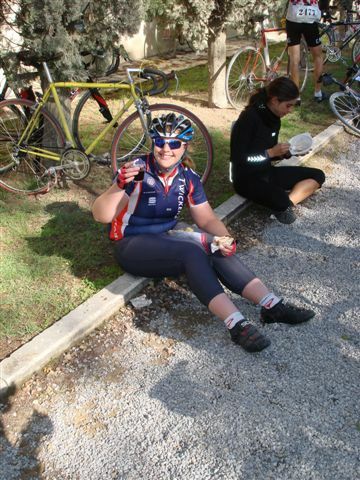 There were a few taxing tough hills, but I’ve happily got a short memory! 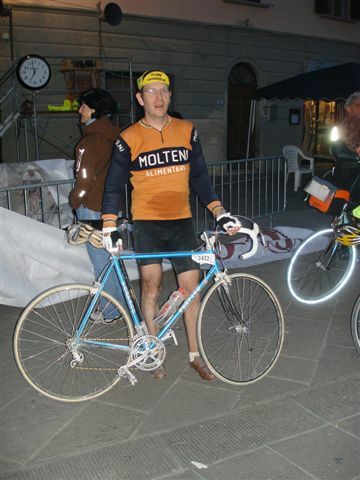 Jason returns just before 7pm (on the Eroica clock) having covered 205k and approx 3500m of altitude variation.